I remember seeing my elder cousins having hefty ThinkPads from work. 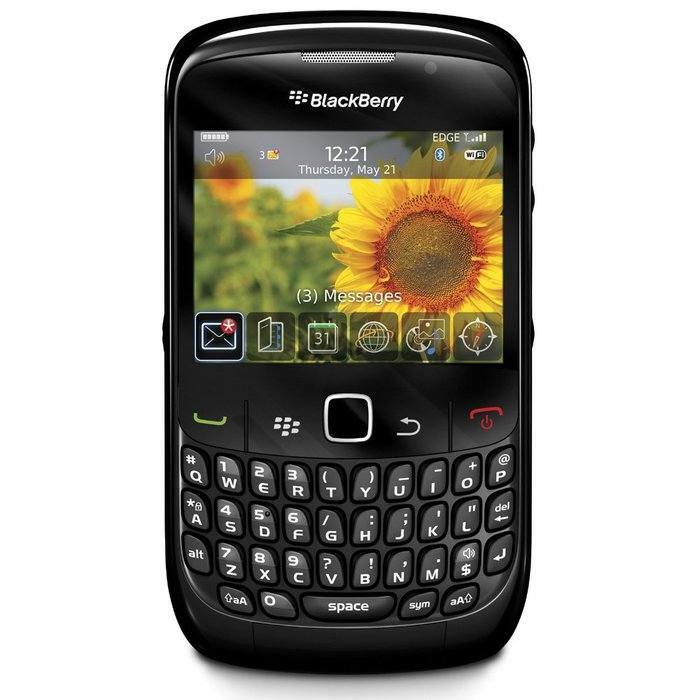 Android was not even there in the scene, while BlackBerry phones (fondly referred as PDAs) were the de-facto standard of corporate communications. These ‘business purpose’ devices were usually looked dull, especially compared to their consumer oriented counterparts. However, they were built like a tank. In some cases, their heavy duty outer shells were capable enough to protect the device from external hazards. With the advent of BYOD (bring your own device), the trend of deploying dedicated business oriented devices are rapidly downfalling. With a properly installed enterprise setup, it becomes way easy to allow employees to bring their personally owned devices to the workplace. Android does support many features out of the box, which are required for such enterprise policies. Google even have this Android Enterprise Recommended initiative under their portfolio. One of the fundamental prerequisites of Android Enterprise charter is the separate Work Profile. Enabling a work profile allows organizations to manage the business data and apps they care about, but leave everything else on a device under the user’s control. Administrators control work profiles, which are kept separate from personal accounts, apps, and data. By default, work profile notifications and app icons have a work badge so they’re easy to distinguish from personal apps. Work profiles allow an IT department to securely manage a work environment without restricting users from using their device for personal apps and data. 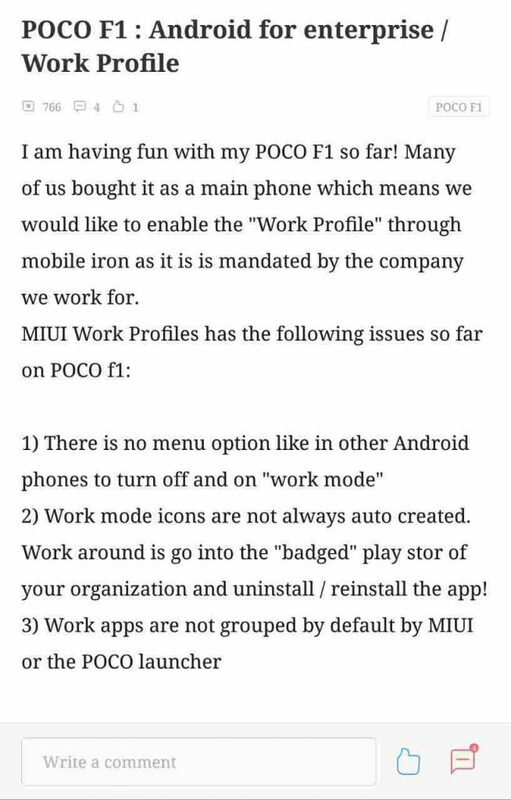 Well, it looks like Pocophone F1 users are having some serious issues with the Work Profile creation, which in turn direct affect the viability of using the phone in enterprise scenarios. 2) Work mode icons are not always auto created. Work around is go into the “badged” play stor of your organization and uninstall / reinstall the app! The third glitch can be easily mitigated by switching to a third party launcher. In fact, affected users are doing so. @MIUI_India I have two profiles. Work and personal. Unfortunately, Poco launcher doesn't provide option to use work profile calendar widget in home screen. Since its a very important option to me, I'm using a 3rd party launcher from the day I bought this phone. Unfortunate! Nevertheless, the bug should be addressed as soon as possible by the MIUI launcher maintainers. Moreover, the second bug is probably originated from the MIUI related modifications on top of AOSP. Dual Apps doesn't work with Work Profile activated through Google's Device Policy! As a matter of fact, the disappearance of the Work Profile app was reported multiple times in past from a number of Xiaomi phones. Missing app icons for apps installed only in work profile. Also thees apps are missing in Settings->Applications menu. 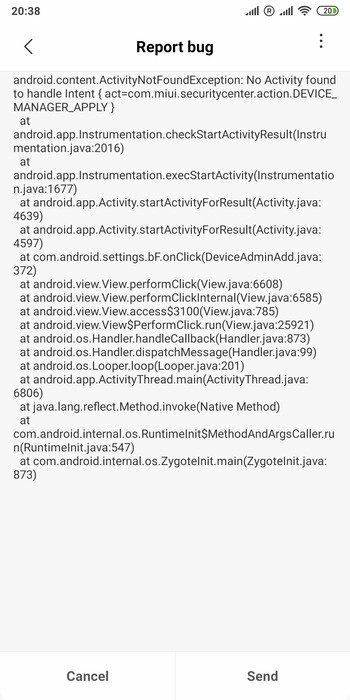 Apps are runnable via Google Play. No problems with apps installed in both personal and work profiles. Mi Mix 3 – same problem. This is related to Xiaomi not being approved as a secure device by Google. Google have higher demands on security for Work Profile functionality to support Enterprise customers. Xiaomi is not a phone you can use as a business phone. While it is possible to get rid of this bug by a workaround, there are other major issues as well. You need to install the applications you want to install from your Enterprise play store with the regular play store. Once it’s done install the apps with your entreprise play store and you will see the icons ! After you can delete the apps installed with the regular play store. Upon attempting to complete EMM token (DPC identifier) provisioning, the device fails to complete and returns to an earlier point in the setup wizard. This will continue until the device is factory reset via recovery (power + vol up on this device). Despite EMM token provisioning failing, when provisioning fully managed (work-managed) with a managed Google account, the device brings down the Google DPC without issue, however the setup wizard continues to interject throughout this process, which it should not do. The full report can be found here. Unfortunately Pocophone F1 did not qualify the test because of these imperfections. As a fully managed device, it was only possible to provision it in this way via managed Google accounts, rather than the more popular and easier to implement managed Google Play accounts; without NFC, QR and EMM token provisioning methods available (the latter actively causing a loop) the device is basically unsuitable, even if it does enforce almost all of the limited number of restrictions offered by G Suite. From the user feedback, it is evident that MIUI’s own device security layer somehow contradicts with the Enterprise Mobility Management (EMM) apps. The crash logs (example: here, here, here) clearly show the same. FYI, OnePlus also broke Work Profile creation under OxygenOS in recent past, which was subsequently fixed by them though a new OTA update. Well, using your favorite Poco F1 for work is not as easy as you may think. OnePlus News Daily Dose #47: OnePlus 7 case leak, running Call of Duty on 6T, notch tweaking and more!